Introduction to Vetty Creations whitework embroidery and Yvette Stanton. White threads is Yvette Stanton's blog with her musings about whitework embroidery, the projects she is currently working on, and her upcoming classes. By subscribing to White Threads blog, you can have every post delivered to your inbox on the day it is posted. Its a great way to keep in touch with what's happening at Vetty Creations. Our step-by-step instructional book will introduce you to the delights of Portuguese whitework, bullion embroidery from Guimarães in Portugal. With 10 beautiful projects, over 500 diagram and pages and pages of clear step-by-step instructions, this book will explain all you need to know. Be introduced to our gorgeous book on Portuguese Whitework with this video preview. Written in Yvette Stanton's clear, step-by-step style, The Left-Handed Embroiderer's Companion will be your constant embroidery companion as it shows how to do over 170 stitches comfortably and sensibly, for you as a left-handed embroiderer. Counted thread, needlepoint and surface embroidery stitches are carefully explained, with many helpful diagrams and photos. Written by a left-hander, this stitch dictionary shows you the LEFT way to do embroidery. Explore for yourself the contents of the book. Grab a needle, thread and fabric and try out left-handed embroidery instructions: a sample counted thread stitch, a sample needlepoint stitch and sample surface embroidery stitches. Learn for yourself how easy it is to work with left-handed embroidery instructions, and see whether you should add The Left-Handed Embroiderer's Companion to your embroidery workbasket as many others have done. Many people like to purchase locally, thereby helping to keep local needlework shops in business. In an effort to assist in local sales, we provide a stockists list. Please keep in mind that many shop websites do not list ALL the stock that they have, so just because the book is not listed on their website does not mean that they do not have it. Explore for yourself the contents of the book. Grab a needle, thread and fabric and try our embroidery instructions: a sample counted thread stitch, a sample needlepoint stitch and sample surface embroidery stitches. Learn for yourself how easy it is to work with left-handed embroidery instructions, and see whether you should add The Right-Handed Embroiderer's Companion to your embroidery workbasket as many others have done. Thousands of stitchers have learnt Hardanger embroidery with this step-by-step instruction book ('Elegant Hardanger Embroidery' by Yvette Stanton), and you can too. There are many diagrams to assist you with your learning, and 15 beautiful Hardanger projects for you to make. 'Mountmellick Embroidery: Inspired by Nature' by Yvette Stanton and Prue Scott will assist you in mastering Mountmellick embroidery. This comprehensive book with its step-by-step instructions and myriad photos and diagrams is regarded by many as the best book on Mountmellick embroidery. There are step-by-step instructions for each of the embroidery stitches and the knitting techniques. The 17 beautiful projects are graded from beginner to advanced and provide a wide range of applications. Learn how to make Merezhka Poltavska with the first book dedicated solely to this unique form of embroidery: 'Ukrainian Drawn Thread Embroidery: Merezhka Poltavska' by Yvette Stanton. The step-by-step learning samplers will take you through everything you need to know, using a combination of text, photos and diagrams. There are also 7 attractive projects for you to create. 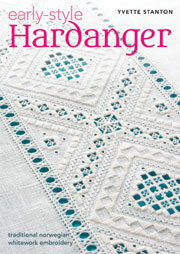 Hardanger is traditional whitework embroidery from the Hardanger region of Norway. Learn what makes it unique, a bit of its history and how you can use it in your needlework adventures. What is Mountmellick embroidery? The stitches and knitting techniques used in Mountmellick embroidery. How to learn and use Mountmellick embroidery today, and where to see historic examples. A listing of all the books on Mountmellick embroidery that are known to us. An overview of all the unique requirements and supplies that are needed to make Mountmellick embroidery, including fabric, thread, needles etc. Learn how to make the traditional Mountmellick knitted fringe with this video tutorial. Merezhka means "cut and drawn work" in Ukrainian, and is a traditional style of whitework embroidery. Learn about it and how you can use it on your items of needlework. Learn about gorgeous Portuguese Whitework from Guimarães in Portugal. About 15% of people are left-handed. Therefore we can probably also say that about 15% of embroiderers and stitchers are also left-handed. If you're left-handed, you'll know that we stitch left-handed in a right-handed world. I don't need to tell you that most needlework books are written for right-handed people, and all their stitch instructions are right-handed, because you already know that. Links for further information about Mountmellick, Hardanger and Merezhka embroidery, Mountmellick embroidery museum collections, and textile related museums and organisations. In the Vetty Creations online shop you can purchase our quality books, kits and patterns for Hardanger, Mountmellick and Merezhka embroidery. We stock specialty threads and fabrics for whitework embroidery. We also have a complete range of Mountmellick supplies including thread, fabric, needles etc. We figured we'd make it easy for you to get all your Mountmellick needs in the one place! Vetty Creations has a range of whitework embroidery kits including Mountmellick and merezhka designs. Vetty Creations has a range of whitework embroidery patterns, specialising in Hardanger embroidery and merezhka patterns. We also have a number of other embroidery patterns that aren't whitework, just to spice things up a little! Vetty Creations stocks a full range of Mountmellick embroidery supplies. Purchase Mountmellick embroidery supplies including satin jean fabric, Mountmellick thread, and needles. Vetty Creations stocks a full range of Portuguese Whitework supplies. Purchase Portuguese Whitework embroidery supplies including 38 count linen fabric, thread, and needles. Vetty Creations stock Mountmellick thread and coton a broder, for use in whitework embroidery. Vetty Creations has a small range of fabrics used for whitework embroidery. These are some of the fabrics that are specified in Vetty Creations' books. Purchase specialty fabric for whitework embroidery including linen and satin jean. We have a range of accessories to help you achieve the best results with your embroidery, including needles, scissors, hoops, magnifiers and lighting. Yvette Stanton is an accredited tutor with the Embroiderers Guild of NSW (Australia). She teaches needlework classes at shops and guild groups around Australia. Her teaching specialties are Hardanger, Merezhka, Portuguese whitework, Mountmellick embroidery, exploring stitches, and left-handed stitching. Listing of magazine feature articles and needlework projects by Yvette Stanton.